The Catholic District School Board of Eastern Ontario celebrated the first of four area Bravo Breakfast Awards this morning at St. Thomas Aquinas Catholic High School in Russell, recognizing students from the Prescott-Russell area schools with the prestigious award. 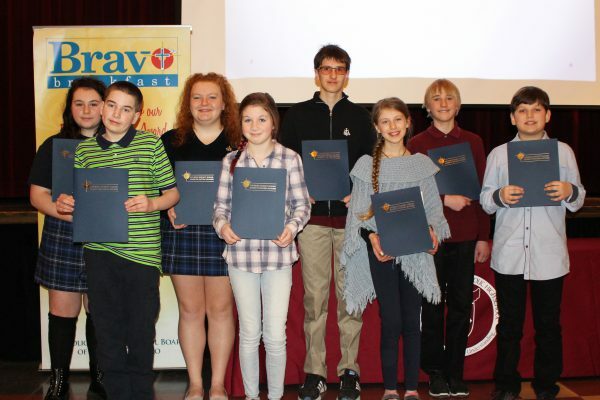 One student from each elementary and secondary school is chosen to receive this award annually, which acknowledges students living out the board theme Be Holy – Joy Springs from a Loving Heart! This is the eleventh year the Board has hosted the celebration. Also in attendance to bring greetings was Trustee for Prescott County and Russell County, Sue Wilson. Vice-Chair and Trustee for City of Cornwall and Glengarry County, Ron Eamer, was in attendance, as well as Trustee for Dundas County, Karen McAllister and Auxiliary Bishop Guy Desrochers, of the Diocese of Alexandria-Cornwall.